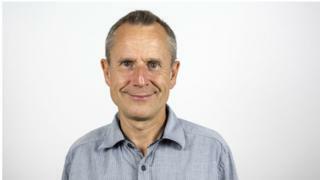 The funeral of comedian Jeremy Hardy has taken place in Dorset. The 57-year-old, a regular guest on radio and TV panel shows, died of cancer earlier this month. The private ceremony, attended by family and friends including Labour party leader Jeremy Corbyn, took place in Purbeck on Monday. Actress Juliet Stevenson tweeted that Hardy had been buried "by the sea in Dorset" and added: "No words for how missed he is, will always be." Labour confirmed Mr Corbyn, who described Hardy as "a dear, lifelong friend", had attended the funeral after photos of him travelling on the Sandbanks chain ferry were shared on social media. Hardy was a regular on BBC Radio 4's The News Quiz and I'm Sorry I Haven't A Clue. Originally from Farnborough in Hampshire, Hardy studied modern history and politics at the University of Southampton before embarking on his stand-up career. He made his name on the comedy circuit in the 1980s, winning the prestigious Perrier Award in 1988 and best live act at the ITV Comedy Awards in 1991. As a lifelong socialist, Hardy's political views were often reflected in his work. His publicist, Amanda Emery, said his wife - filmmaker and photographer Katie Barlow - and his daughter were with him when he died.